Users can individually and collaboratively arrange ideas to express relationships and connections. They can save their arrangements and annotate the arrangement with an explanation. Each box can be moved around to create logical groupings of ideas. To do this, simply select the blue bar at the top of the Idea Box that you would like to move and drag it to the desired location. Select the icon to save this arrangement for later use. Select the icon to return back to the original automatic arrangement. Select the icon to see the Display Options. With the Display Options, you can customize the font size of the text, choose the number of columns in which the ideas are presented, show/hide responses, display/hide names, show/hide the highlighting options. 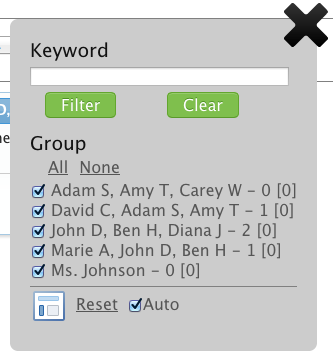 With Filter and Search, show/hide the ideas of specific groups and show/hide idea based on keywords.